I love thermal polish...when it works. I'm always a little wary when trying a new one, but this one was only $6 when I was placing that big-ish Llarowe order last month. I did a quick google and found swatches on A Little Polish. It's hard to really tell on short nails, but it seemed like decent stuff, so it went in my cart. I broke it out to wear as a work mani last week. 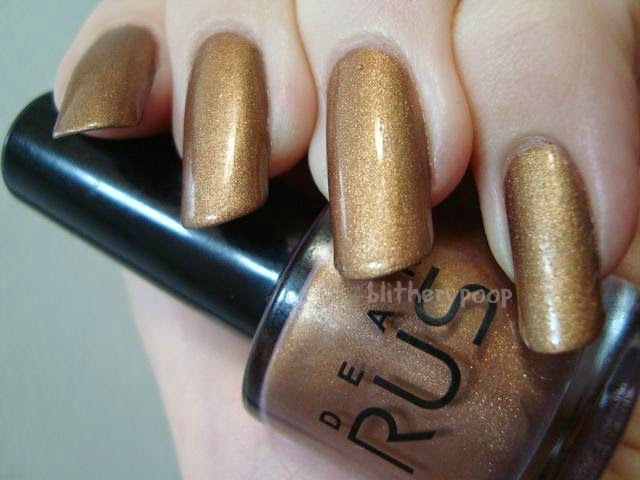 Shade Shift 09 is a bright-to-dark orangey gold thermal shimmer. This bottle is tiny. $6 no longer seemed like such a good deal when I unwrapped it. Oh well. This is two coats and the formula is decent, though I did get a weird little lump that turned up on my ring nail. I think it was the thermal pigment. The warm color is bright, but flattering. It's a good thing I like it, because it's what I saw most. Part of that is my own fault for wearing a thermal in June. Still, having played around with cold water and ice I feel like I can safely say that the color change isn't all that strong. See what I mean? That is subtle, isn't it? I'm going to give it another chance when the weather's colder, but so far I am not impressed. The cold color is richer, less orange, and darker, but not too dark for work. Bottom line: I like both the cold and warm colors, but didn't see much of a contrast between them when the tips were colder or warmer than the bases. Cold weather could make a difference...maybe. In hindsight I'd probably have skipped it, especially considering how small the bottle is.